MY LITTLE INTERNET HOME. WELCOME. How are we halfway through the One Room Challenge already? In 3 weeks, I am to have not only a completed room to share with the internet, but also to have cleaned it and made it pretty and photographed and written about it. But, let’s be honest, the writing part doesn’t frighten me. I might not chat your ear off in person, but I can go on and on (and on!) while typing my innermost thoughts and feelings about interior decorating. Maybe it’s an introvert thing? BUT, I am getting off topic while simultaneously proving my aforementioned point. Let’s get into the ORC! If you’re not sure what I’m talking about, the One Room Challenge is an amazing event hosted twice a year in which 20 featured designers and hundreds of guest participants (me!) completely transform a room in 6 days. Just kidding, 6 weeks. It’s fun. It’s crazy. It’s my second time doing it (see my first reveal here) and read on for my week 3 update! So I ended last week’s post feeling pretty uncertain about where we are going to end up. I made a few mood boards, but honestly was still trying to decide what we’re doing here in the bedroom. I’m happy to say that while I haven’t purchased or made everything we need yet, I finally have a clear picture in my head and now all that’s left to do is create it! Half the battle is won, right? One thing I was agonizing over was our bed. I love a modern looking upholstered bed frame, but I knew I wanted it in black and was having a hard time finding any affordable options that weren’t fake leather. Phew, did you follow all of that? I finally decided that while it might be easier to get a $200 tufted pleather bed frame, it’s not what I am in love with. Since I have also been paring down my wardrobe during this makeover, I can’t in good conscience buy something while only loving it at 50%. I mean, after getting rid of half my clothes, I would never do that with a sweater for $30! So why would I consider doing with with a bed frame for four times as much? My new idea (which is really my old idea. Trust your gut, friends.) is to DIY a headboard about of black velvet. I know! It’s a little late in the game to be deciding to whip up a headboard “really quick” but, I MEAN. BLACK VELVET. Brandon, if you’re reading this from your hotel room while on your work trip - don’t freak out. I promise it will look great and you won’t end up doing all the work. I am also quite proud to say that I have completed the Great Closet Purge of 2018. It’s possible, ya’ll! We can fit all our (in season) clothes in one closet and one dresser…with room to spare! Our closet still needs some organizing and some beautifying, but it’s a definite improvement. I feel like I can breathe so much easier, and I also want to get rid of half of the rest of the house. All in good time. After a quick trip to Lowe’s earlier this week, I can home with several different knobs to see what looks best with our dresser and nightstands. Nothing is going to make it less-orange or less beat up, but new hardware can hopefully shine her up enough to look vintage-cute and not Craigslist-shady. I really loved the black and gold knobs - so cute! 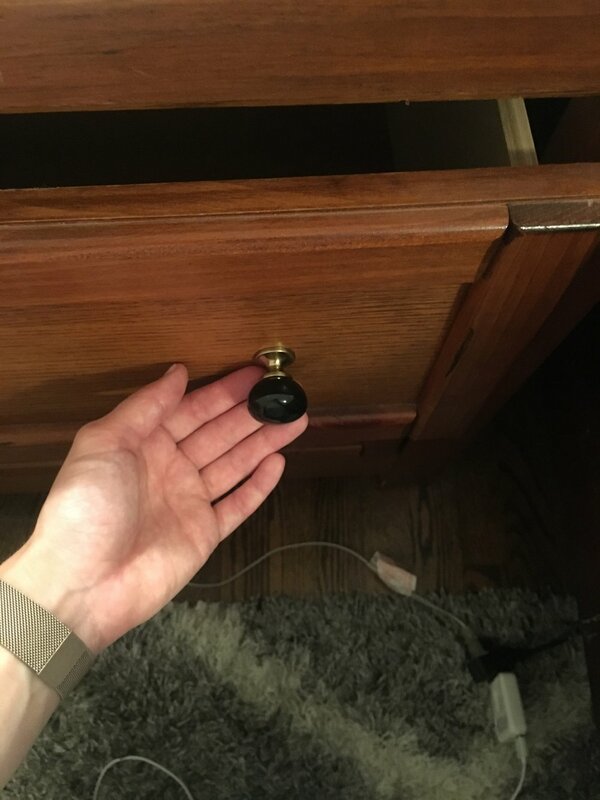 So I decided to use those for the nightstand drawers and slightly bigger, all black knobs for the dresser. It’s my bedroom I’ll have mismatched knobs if I want to! Lastly, I think I’ve decided on a rug for the room. I mean I know I fell in love with one, I’m just trying to decide if the price is right. Isn’t she nice? Should I just go with it? Is 11:30 on a Wednesday night a good time to make a decision? I know this wasn’t a juicy blog post, but sometimes progress is just like that. Kind of like falling in love…slowly, and then all at once. What’s up, blog! It has been a MINUTE. A minute full of family vacation and reunions and weddings and birthday parties and international travel, but a minute nonetheless. I’m so excited to be in a place where I feel like I can devote more time to my blog, and what better way to get back on the horse then a challenge with a 6-week deadline? That’s right, I am doing the One Room Challenge again! If you are not familiar, the ORC is an online whirlwind in which bloggers and instagrammers take one room to completely transform in six weeks, and of course document the whole thing. I first participated this past spring and you can see my final reveal post here. When I brought up the subject of doing the ORC again, Brandon gave me quite the look. As in, have you forgotten all the pain and stress we went though, night and day, just a few short months ago? Not being a mother, I am the least qualified person to make this comparison, but…I hear childbirth is similar. You either forget, or you love the finished product enough to do it again. Or so I’m told. But to be honest Brandon is a total sport and is more than willing to help me whip this room into shape. An added challenge this time around will definitely be our budget. Now that’s not to say we weren’t thrifty during the last round, but we returned from a totally magical and wonderful and expensive trip to Ireland just this week. So I am personally challenging myself to do this as cheaply as possible. The room I’ve chosen to make over might seem like an easy choice - not a kitchen, bathroom, no walls coming down. To be honest it’s pretty much just a revamp. But with 6 weeks and a starving artist type of budget, I think I will have my hands full. Let’s see our how our bedroom looks currently. If you’ve read this post, you’ve already seen the first photo. This was taken around Christmas time last year, when the room was a bit tidier. I’m putting my best foot forward here. CURTAINS. For the love of donuts, get rid of the bed sheet tacked into your window frames! I am so ashamed that the privacy bed sheet is still in place after throwing it up there the first night we spent in this house. I am still unsure if I want to get woven bamboo blinds, or try to make Roman shades for the windows. The afternoon light shines so prettily in here and I want to be able to take advantage of that. And hey, maybe even be able to keep a plant or two alive in there! BEDDING. While I sort of like our current duvet, I do not love it. In addition, I have come to the conclusion that white sheets, while sworn by by many bloggers on the internets, might not be for us. Not to be gross or nothin’ but YA’LL. I need something with a little pattern to be a little more forgiving of dirt, yellowing, and brownie crumbs. DRESSERS/FURNITURE. 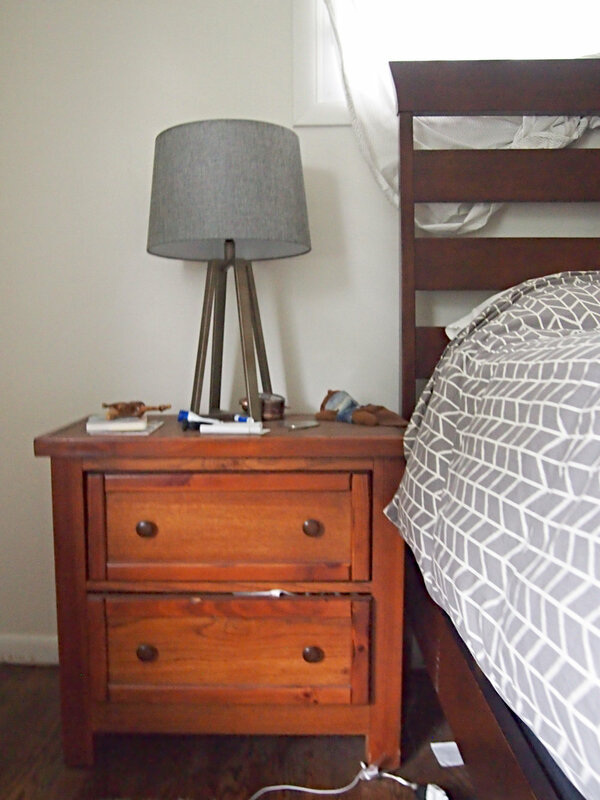 All of our bedroom furniture was purchased either right before or right after we got married three years ago. They weren’t impulse buys, but they were necessity buys. Meaning we needed something so we bought the first good option that came along. Now I don’t think we’re going to be spending the money to replace a lot of furniture, so I am going to try and see what changing the knobs does for the looks of the dressers and night stands. I also would like to get a new rug and lamps, so hopefully the people of Facebook Marketplace want to buy mine! TRIM. As with every other room in our house, we’re replacing the current cheap-o trim. This isn’t a necessarily hard task, but its one I need help with and does take time. CEILING FAN. I am team She Cute but I think most others who see our room would be team Take It Down. Maybe it’s just because I’ve gotten used to it or maybe it actually can be cute! ORGANIZING/PURGING. All you have to do is look at the photo of the closet (woof!) to know what I mean. I’d love to get rid of the tall dresser and store our clothes in just the short wide one, but that will require some serious cleaning out. GENERAL DECOR/EVERYTHING. Self explanatory (she says as she elaborates on this point) but as I said before, I put no effort into making this room nice. It is time for nice up in here. Art and frames on the wall, a vase, a nice throw pillow or two. You know, NICE. Well that’s not even a proper to do list, but it’s a start! Even though I know how much hard work this challenge requires, I am so excited to get started. Part of the reason I chose our bedroom to use for this was because I truly, finally have a vision for this room. I have so many ideas, and finally an excuse to execute them. Wish me luck. Unsolicited pro tip: if you want time to go even faster than it already does, sign yourself up for a 6-week challenge. If this is the shortest update post ever, know it is because I gots things to do! The One Room Challenge is a blogging challenge hosted twice a year in which the participants make over one room entirely in 6 weeks. Next week is the big reveal, which I’m so excited about! But also, send all the prayers. We got so much done this week which feels amazing! But for some reason my to-do list is growing instead of shrinking. Let’s recap the progress so I feel better about myself, ‘kay? Hemmed and (mostly) hung! Check. A big thank you to my mom for measuring and hemming and ironing the curtains. She came over to deliver the dining room curtains and they look beautiful. She just texted me yesterday to say the living room curtains are finished, so now we can do what I've been dying to do since we moved in - take down that yucky green curtain on a track. Painted and (mostly) hung! The door to the garage was finished on Saturday and looks so nice with the new trim. *heart eyes* The closet doors are finished and one is still drying in the basement. Last night Brandon hung the finished and dried door, so our view doesn't look exactly like this anymore! Almost completely installed! Saturday was a glorious day of work here, and most of Brandon’s family came over to help! Along with his dad and brother in law, Brandon was able to install almost all of the baseboard and most of the door casings. Brandon’s sister, mom and I spent some of the day painting the trim. Like I mentioned last week, we bought primed trim and are painting before we install. As of last night, we just need to install trim along the wall that divides the kitchen and living room. And of course, patch and caulk and paint. I am praying this doesn’t take too long! I finally got up the courage to paint our dining room chairs! So far I have one completely finished. Only 4 to go! Yes, we only have a set of 5 chairs. I guess that's what happens when you buy them at a yard sale. But oh well, without the extender leaves in our table, it only seats 4 comfortably anyway. We'll probably keep the 5th chair in the office for now, and pull it out for extra seating as needed. This week, I also started getting together our accessories and finishing touches. I practiced styling the shelf, make a Home Goods run, and finally brought our pretty antique mirror up from the basement. I can’t wait to see it all together! A quick side note, though: I am no longer in love with this shelf idea. I am proud of Brandon and I for whipping this up, but I don’t think the stained wood fit in with my slightly traditional, slightly modern, slightly clean and minimal vision. Would a plain white shelf be better? Should I go back to a big picture frame? Ugh. - decide on shelf vs. picture?? So, there’s the scoop. See you next week and wish me luck!